Trying to decide whether it’s safe to re-use a Torsional Vibration Damper (TVD) bolt is not straightforward. For a start, not all bolts are the same, not all TVDs are mounted in the same way, and they do not all use the same number of bolts. Making the right decision is crucial. Gates offers a helping hand. ￼A wrong decision could cause a premature drive system failure that will lead to comebacks. In the worst-case scenario, debris from the Accessory Belt Drive System (ABDS) could compromise the timing belt and cause catastrophic engine damage. TVDs, or damper pulleys, absorb vibrations. Essentially, these vibrations arise from the use of more and more lightweight components to reduce overall vehicle weight and reduce carbon footprints. The additional power from increasingly powerful compact engines creates conflict. Greater power adds strain on lightweight components – causing the vibrations. The pulleys achieve this thanks to a rubber damping agent, designed to absorb most of the vibrations. That’s one reason why Gates encourages mechanics to install ABDS belt kits that include new TVDs. Installing a TVD correctly protects all the components in the drive system and extends their operational lifetimes. There are additional complications to consider. For example, bolts that encounter elastic, temporary deformation during fixation can be re-used. This is because they regain their original form after the stress is relieved. Bolts that encounter plastic, permanent deformation during the installation of the TVD, cannot be used to install a new damper, as they might break. Moreover, some TVD bolts always require replacement. Others can be re-used without any issues. If there is more than one bolt, the crucial decision is multiplied. Replacing all the bolts all the time is one solution, but throwing away a good re- useable bolt negates some of the vehicle manufacturer’s initial efforts to reduce the overall environmental impact. The sensible solution is to always replace the bolts that must always be replaced. Recycling re- usable bolts safely saves resources and respects the environment. 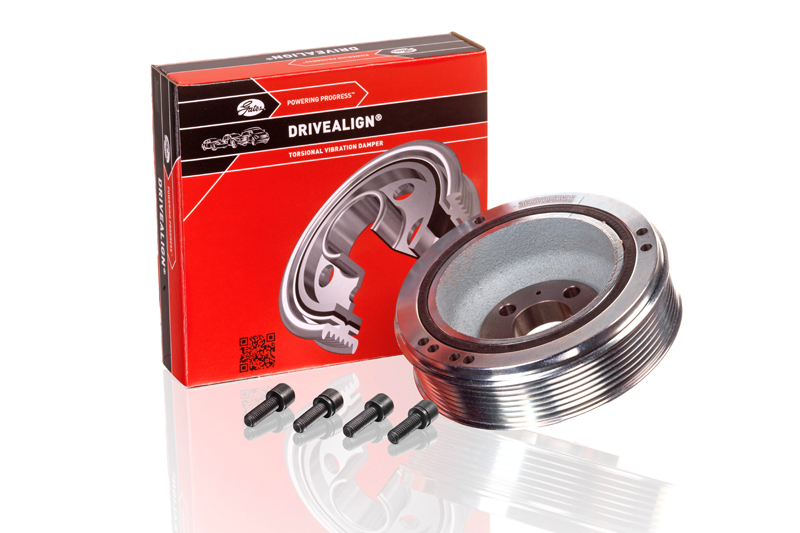 Gates has updated its entire DriveAlign TVD range. Each red Gates box includes the TVD and just the bolts that must always be replaced. In other words, as an installer, you get everything required to complete the job with premium parts, technical clarity and peace of mind. It’s an environmentally respectful job well done – every time. For more information on the range of products available from Gates, click here.